The first time I made stuffed spaghetti squash (my vegetarian enchilada version), I couldn’t believe how filling it was. I could barely finish one stuffed half on my own. MY HUSBAND – the guy who runs a gazillion miles each week and can polish off an entire pork tenderloin in one sitting – was full after his last bite. So, if you were thinking that a meal revolving around a stuffed vegetable wouldn’t satisfy the big eaters in your family, I urge you to reconsider. 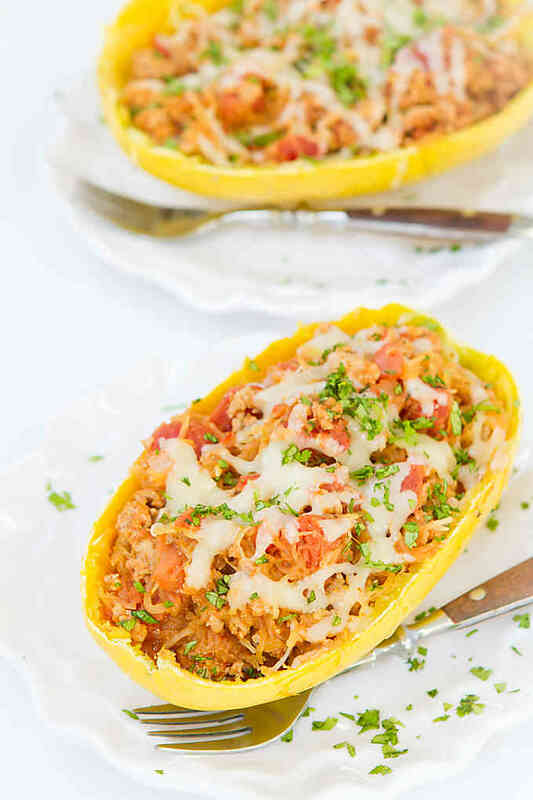 And if my Turkey Taco Stuffed Sweet Potatoes regularly show up on your table, you are going to love this turkey taco stuffed spaghetti squash! 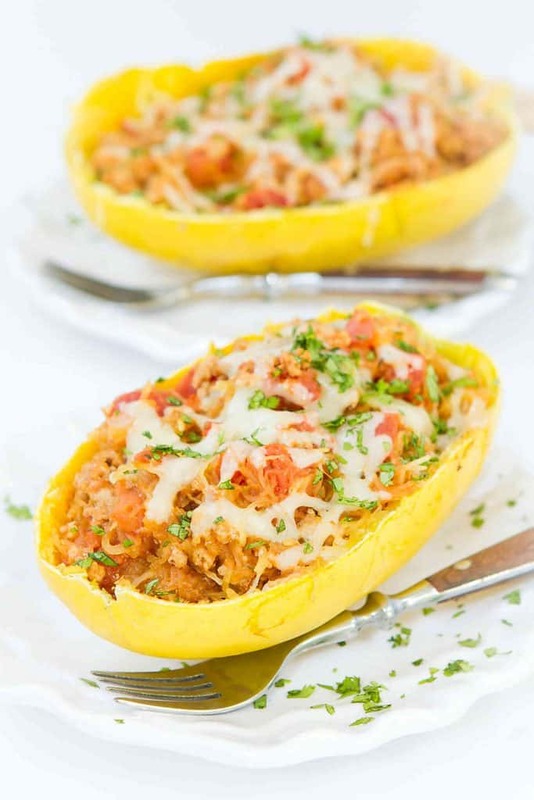 Stuffed spaghetti squash meals are versatile, easy and healthy. Here are a few tips to make them work for your dinner table. For a 30 minute meal, cook the spaghetti squash in the microwave, as directed in this recipe. If you prefer, roast the spaghetti squash halves (cut side down) in a 400 degree oven for 45 to 50 minutes. Let the spaghetti squash rest for a few minutes before cutting it in half to avoid burning yourself. Once you scoop out the inner seeds and “goopy” strands, use a fork to twist out the good spaghetti squash strands. Go meat or meatless by changing up the protein – beans, chicken, ground turkey, pork, tofu. Change up the flavors. Enchilada-style, pesto-style and Thanksgiving stuffing-style are some of my favorites. Serve this alongside a kale salad for a complete meal. Using a large, sharp knife, pierce a spaghetti squash in several places. 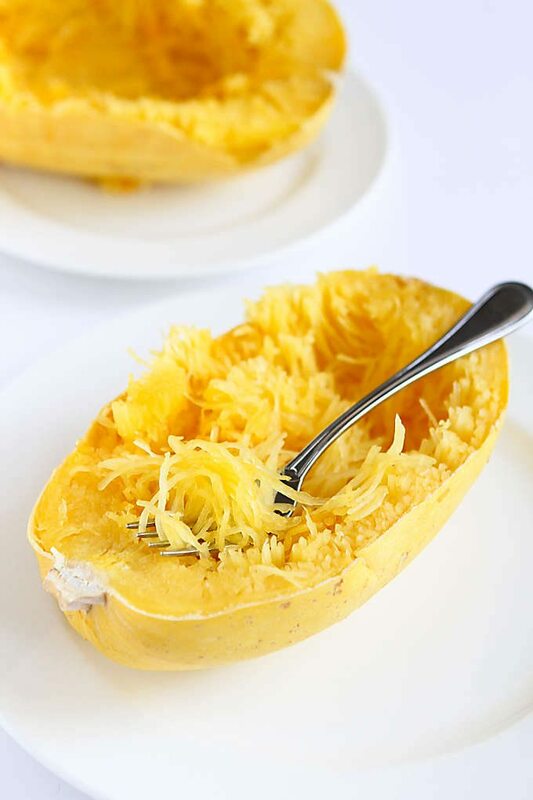 Place the spaghetti squash in a glass baking dish and cook in the microwave on HIGH for 12 to 15 minutes, turning the squash halfway through cooking. Before handling let the squash stand for 10 minutes. Cut in half lengthwise and scrape out the seeds and fibers. Heat the olive oil in a large nonstick skillet set over medium-high heat. Add the ground turkey and onion. Cook, breaking up the turkey with a wooden spoon, until the turkey is cooked through and the onions are tender. Stir in the garlic, cumin, oregano, chili powder, paprika, salt and pepper, and cook for 1 minute. Stir in the diced tomatoes and spaghetti squash strands, and cook until heated through, about 1 minute. Place the spaghetti squash shells on a large baking sheet and fill with the turkey mixture. Top each with 2 tablespoons grated cheese. Place under the broiler and cook until the cheese is melted, about 1 minute. Watch closely so it doesn’t burn. I’ve never cooked spaghetti squash in the microwave before….how can you tell its done when you leave it whole? Thank you! This sounds absolutely delicious. Post fires here in Southern California, and this looks wholesome, fresh, and simple. Might double it.